Wow this summer has been such an exciting whirl wind! First there was the shoot with Flashes and Lashes with Scarlet Daggers modelling. Then the expert pin up girl make over team invited me to their studio for a shoot with me modelling! And it all spiralled from there! Leading to fashion shows with Miss Fortune Clothing at Americana festival and another fashion show, Pins and Needles with Charly Chaplin. I had such an amazing time at both fashion shows I thought I would organise my own! As I have been so busy this summer to write the content of my website, it has kind of fallen by the wayside. So I thought what better way to shout about its launch than to have a big party to celebrate. I want to thank everyone who has helped me. I have learnt allot about starting a business and I still have allot more to learn. I would like to thank all who have answered my confusing tweets, replied to my emails. All the photographers, models, make up artists I have worked with, who have supplied me with amazing images that really bring out the best in my designs. So the event. I am looking to hold it in the city centre of Nottingham towards the end of March beginning of April 2012. I have emailed a couple of venues already. But any suggestions would be greatly appreciated. Fashion show, I am pretty confident I can organise this. I will be pulling in all my contacts whom I have worked with previously, so look out for that email! Bands, I am looking for a rock and roll band, rockabilly. 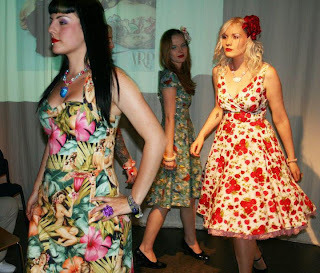 My clothing is heavily inspired by my love of rockabilly and I want the after party, dj and band to reflect this. So if any midlands based bands are interested do get in touch. DJ, I have a few in mind. But again if you are interested do get in touch. Burlesque act, already booked, Rose Desire Belle. Light and sound, hoping to get a venue with a light and sound techs included. But if anyone fancies helping me out. Do get in touch. Posters and flyers. (maybe a program with ad space) I would be looking for a graphic designer who can lend their talents. Also any contacts with cheap or discounted printers would be greatly appreciated. Booze! Any reps of any beverage companies please do get in touch. Goodie bag, I want to give each guest a goodie bag. This will include literature of all my sponsors, people who have helped out with the event, a great chance to advertise to a target audience. Also if anyone wants to donate anything for the goodie bag, get in touch. Raffle, any company who wants to offer a prize. I could run a raffle. Good opportunity to promote your business. Sponsors, any company who wants to be a part in this event, offer sponsorship of any kind please get in touch. I have little or no budget for this event. 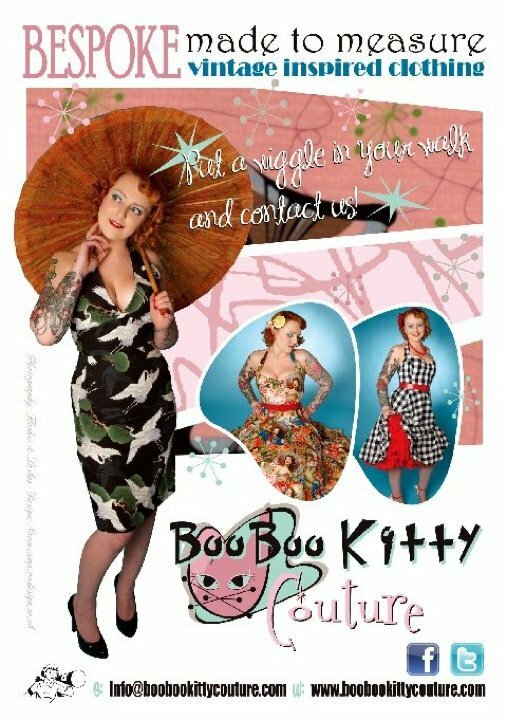 I am hoping it will be great fun for all involved a great chance to show that Nottingham is the best place for vintage, pin up, rockabilly lifestyle. There are so many talented small businesses and individuals out there in the midlands. This is a great opportunity for us to work together and create an event we can all be proud of and have a jolly good time whilst doing so! Please email me at info@boobookittycouture.com any advice or help with this even is greatly appreciated! Who knows, I might even make it down from Newcastle. You look truely stunning hun.